Contest: WIN: a FREE Etonic Makeover! WIN: a FREE Etonic Makeover! 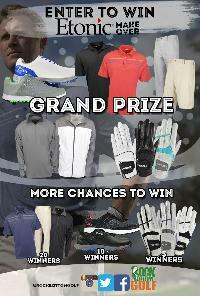 Prize: GRAND PRIZE: One winner will receive a FULL Etonic Makeover including shoes, (2) polos, pants, shorts, (3) gloves, pullover, wind jacket, umbrella & shoe bag!